"The flash of light you saw in the sky was not a UFO. Swamp gas from a weather balloon was trapped in a thermal pocket and reflected the light from Venus." Are you a government official or similar authority who needs a quick, mundane excuse for a large number of mysterious, possibly supernatural deaths? Gas leaks are the way to go. They're accidental (no need to find a scapegoat!) and provide a good reason to keep people away from the site of the disaster (there might be lingering traces of gas there, after all!). You can even say that the gas was hallucinogenic, so that if any survivors or bystanders saw anything weird, well, that's why. And as a very last resort, it leaves you with a plausible explanation for the whole site conveniently exploding. The general populace will always swallow this one hook, line, and sinker, no matter how many times you use it or how implausible it is (maybe it's just that they're more comfortable believing in gas leaks than in demon attacks or the like). Watch out for nosy teenage detectives, though. Those are a bit harder to fool. This excuse can also be used to clear a given area so that no ordinary citizens get caught up in the supernatural or otherwise dangerous activity to begin with. Please note that this trope applies to using gas leaks to cover up for other things, not covering up for gas leaks (unless an actual gas leak is being covered up by a story about another gas leak). If that's what you were looking for, we recommend blaming the dog. For cover-up excuses that don't involve gas leaks but are just as flimsy, see Extra-Strength Masquerade. Compare with Fiery Coverup. Fate/stay night has a series of such "accidents" to cover up a Servant stealing life energy from assorted Muggles. Higurashi: When They Cry's "Hinamizawa Disaster" is said to be a gas leak—a bit of a borderline example, as gas really was released into the town...it just wasn't accidental. And by "not accidental", we mean the town was herded into schoolrooms and killed with poison gas grenades. Hollow attacks in the first few episodes of Bleach were designated as such. Early in Darker Than Black, a Contractor completely lost control, causing a couple of massive explosions. This being the show that it is, the attempts to evacuate the area around the "gas leak" just made things worse, with the kid accidentally burning a friend to death who tried to get her to go to a shelter. In the second season, Gemna gives an early hint of his craziness when, once he and his partner start attracting attention with an urban battle, he deliberately creates a gas explosion to give some Plausible Deniability. In a later episode, his boss makes an irritated reference to a supposed gas explosion in Russia rumored to be a massacre by Contractors. In Magical Record Lyrical Nanoha Force, the official records give a combination of earthquakes and poisonous fumes as the reason behind the complete destruction of Tohma's Doomed Hometown in the world of Vaizen. Considering how he actually saw the possible culprits, Tohma understandably questions the truth behind that statement. The destruction caused by Kuesu and Shizuku's rooftop battle in Omamori Himari is officially explained as a gas line rupture. When learning about this on the news, Kuesu dryly commented that she didn't know that people installed gas lines on the top of buildings. In The Case Files of Yakushiji Ryoko, the destruction of a skyscraper in Ginza is attributed to a large-scale gas leak and explosion. In reality, the building's owner belonged to a cult that had bred a colossal snake and kept it near the top of the building. Inspector Yakushiji gave it a massive dose of growth drugs that caused it to instantly grow large enough to tear the building apart from the inside. In Mobile Suit Zeta Gundam, the Titans' pumping of poison gas into a space colony, killing all the inhabitants, was covered up as a malfunction of the air recycling system. In PS238, when Suzie Fusion loses her temper and almost blasts a group of mean older girls, this is the excuse used to cover up the incident. In fact, the school turns out to have large quantities of empty pipes running around the entire campus. This is just so they can claim any one of them had burst to cover up things like the odd explosion, or people with radioactive superpowers (like Suzie) irradiating the playground. In Fables, the first time Briar Rose falls asleep in the series, the Fables cover it up as a gas leak. Arkham Asylum: Living Hell: In the aftermath of a demonic invasion of the asylum, Dr. Arkham decides the only rational explanation is that Scarecrow dosed everyone with fear gas. As punishment, Crane gets a month in isolation. The Cybertronian Senate seems to have been fond of the phrase "faulty energon line" when it comes to explaining away various arsons and bombings in The Transformers: More Than Meets the Eye. It doesn't work in the long run, however; by the comic's present day, the Senate no longer exists. Subverted and mocked in Fate:Zero Sense. After the fight between Rider and Lancer was seen by whole areas of civilians in broad daylight, the cover-up used to calm down the population was to tell them that it was special effects used for a movie by James Cameron. Kariya's reaction is to point out that it's still a better excuse than gas leaks. Used as a plot point in Fate/Stay Night: Ultimate Master. The Plumbers are Genre Savvy enough to suspect something and send Ben Tennyson to investigate, leading to the whole plot of the fic. A later chapter actually has Ben comment on how flimsy this excuse was. In Fate Parallel Fantasia, gas leaks are used as the standard explanation for people falling unconscious due to being drained of prana, mostly by True Caster and True Rider. In The Horsewomen Of Las Vegas , in the chapter that flashes back to when Charlotte Flair was a college medical student with plans of being anything but a crime boss. After her father and his most trusted associates showed her evidence that her best friend, Santana Garrett, and her fiancee, Shane Douglas, were undercover FBI agents, they leave her alone with them and leave a gun behind for her to shoot them. Once the deed is done, Tully Blanchard said , "Now it's time to arrange that gas leak" as they prepare a Fiery Coverup. The trope is exaggerated and Played for Laughs in the first Men in Black movie; as evidenced by the page quote, the typical cover story for UFO sightings given by MIB agents takes multiple elements from every standard, individual variant of the trope (swamp gas, weather balloons, Venus) and combines them into a single cover story. Though the MIB do put more effort into making it seem legitimate (such as having a crew of cleanup agents use flamethrowers to both burn away evidence of aliens and scorch some of the nearby terrain) and they have the added benefit of a memory-erasing device. The neuralizer goes a long way for justifying the whole ordeal: the brain will invent new memories to fill the gap, during which time it becomes very impressionable. Subverted when Agent K tries to use such a coverup on a woman whose husband was killed and skinned by an alien. Agent J calls his coverup garbage, and instead offers the explanation that she threw the husband out for being a Domestic Abuser (what little we see of him pre-death suggests that this was pretty close to the mark). Close Encounters of the Third Kind has the government claiming a rail accident occurred with a train carrying nerve gas as a way to evacuate everyone from the area around Devil's Tower, Wyoming, where the Aliens are soon due to show up. Maj. Lennox: All right. China's cover story this time is "toxic spill"; they had to evac the area for Search and Rescue. Ghostbusters II contains three, and none of them work. It's the scene where Egon and Peter hold down the fort over a hole they dug while Ray abseils down it into the river of pink slime. First, Peter tries to convince the police that they're with ConEd; he then tries to convince them that they're with the phone company; finally, he pulls out the gas leak line. And then all of NYC goes into a blackout! In The Living Daylights, assassin Necros uses this to cover up his attack on the Blayden safehouse, before throwing tear gas grenades hidden in milk bottles. As everyone evacuates, he kidnaps his target under the guise of a medical evacuation. In Mission: Impossible  Ghost Protocol, half the Kremlin blowing up is put down to gas lines exploding, and an unexploded nuclear warhead plunging down on San Francisco is a meteorite. When half the planet believes in Conspiracy Theories, why bother coming up with a plausible explanation as long as you can disavow it officially? Indeed, the way the civilian news reports are phrased indicates that pretty much no-one believes the "accident with the gas mains" coverup. In Godzilla (2014), the Janjira incident was caused by the male Muto burrowing into the plant's core and feeding off the radiation until it grew to maturity. The surrounding area wasn't evacuated due to radiation but to hide the existence of the Muto's cocoon. In Star Wars: A New Hope, Han Solo, answering the operator of a concerned nearby station following the dispatch of the Death Star detention block's guards and security cameras, attempts to buy time for Luke to find Princess Leia by claiming a reactor leak is in progress, asking for time to shut it down. It fails miserably. Hellboy II: The Golden Army. FBI Director Tom Manning tries to use a gas leak story to cover up the BPRD's investigation of Prince Nuala's massacre of an antiquities auction. Then Liz uses her pyrokinesis to set off the corresponding explosion...and Hellboy intentionally positions himself where he'll be blown out a window into the midst of Manning's crowd of reporters. Hellboy: World, here I come. Fantastic Beasts and Where to Find Them demonstrates a Double Subversion of this trope. A cop tries to claim the destruction at Kowalski's apartment is the result of a gas leak, only for all the witnesses to berate him and point out the lack of gas's scent. One man steps up to say that they all saw a magical beast cause the destruction, but before he can, Newt casts a spell over all of the witnesses and they frantically claim in agreement that it was a gas leak that caused everything. John Wick: Chapter 2: Jimmy the policeman takes one look at John's house, which is on fire from several grenades, and says "Gas leak?" It's made clear in both movies that Jimmy knows exactly what John does for a living, and is willing to accept any semi-plausible excuse to keep the rest of the police from getting involved. In Harry Potter and the Prisoner of Azkaban, the attack Sirius Black is accused of is described by Muggle authorities as a gas explosion. Of course, the latter may be a legit consequence of the former, because ordinary spells don't blow up the whole street. In the second Montmorency novel, an explosive terrorist attack at a train station is covered up in this manner. The truth is never made public, and the repairman blamed for the faulty line hanged himself a year later. This trope is used both literally and in the more general sense repeatedly in The Dresden Files novels as a theme illustrating the hapless nature of non-magical humans. One book lampshades and discusses it; Harry predicts that the latest bit of magical shenanigans will be explained by a gas leak, to which Billy retorts that subsequent inspection of the building will show that the gas pipes are intact, the gas company's monitoring instruments will detect no loss of pressure at the site, none of the victims will show symptoms of gas inhalation, and so on and so forth. Harry cuts him short by simply pointing out that nobody will want to admit that they have no idea what happened, so, to pacify the public and preserve their own jobs, they'll explain it away as a gas leak. This argument is reinforced by the fact that the experienced medical examiner Butters reported the discovery of "human-like, but definitely non-human" remains (actually Red Court vampires, which resemble human-sized bats) in a fire and immediately got suspended from work, given a forced psychiatric evaluation, and permanently landed with the worst assignments for having let the stresses of his job get to him and prevent him from recognizing what were obviously human remains that had been badly warped and distorted by the heat. In Honor Harrington, an "air car explosion" destroys the building containing the North Hollow Files , which were loaded with blackmail material to extort cooperation from others. In this case, nobody was really expected to buy it; the destruction of the site they were held at just had to be explained pro forma to match the Open Secret nature of the files themselves. In the Kim Newman Diogenes Club story "Moon Moon Moon", the area around a magical working is cordoned off by the police because of an "anthrax spill". Jeperson comments to his American counterpart that if every anthrax spill in Britain was genuine, the whole country would be awash with the stuff. She replies that her superiors prefer "experimental nerve gas"...unless it actually is experimental nerve gas, in which case they blame it on foot-and-mouth disease. In the Alex Rider book Eagle Strike, this is the official explanation for the attempt on Edward Pleasure's life. In The Rest Of Us Just Live Here the authorities claim that a teenage girl smoking near a gas leak caused the explosion at the amphitheater, rather than the Immortals invading. The Coldest War had some fun with this trope. British Intelligence know a Soviet assassin with supernatural powers is going to murder someone in their custody, so they evacuate the entire street to avoid witnesses and collateral damage using the gas leak excuse. When the assassin does show up, he's disguised as a National Gas repairman. When the entire house and half the street burn up thanks to the assassin Playing with Fire, the government has a ready-made explanation. In The Serpent's Shadow, the third book of The Kane Chronicles, it's mentioned that the accidental destruction often caused by the protagonists of the series is often blamed on gas explosions. Carter Kane: The locals would just have to assume there was a gas explosion. We tended to cause a lot of those. In Rivers of London, DI Nightingale has an arrangement with the Metropolitan Fire Brigade for when he has to Kill It with Fire. The fire brigade will have appliances on hand to make sure the blaze doesn't get out of hand, and the fire inspector will write the fire off as the result of "faulty wiring" or something similar. In Broken Homes, the near-total demolition of a small farm during a magical battle between two veteran combat wizards is written up as the result of some propane canisters exploding. As it happens, one such canister did blow up during the fight, but only accidentally and after the majority of the damage had already been done. Played with in The Long Dark Tea-Time of the Soul; in the aftermath of a mysterious explosion "The usual people tried to claim responsibility. First the IRA, then the PLO and the Gas Board." Played completely straight in Oz. The fourth season ended with an explosion, caused by a home-made bomb created by one of the prisoners, destroying Emerald City. The opening of the fifth season showed the warden reopening the rebuilt prison, explaining the destruction as a gas leak. And everyone buys it. This in a prison that by then has had a major riot, a sexual harassment suit against one the head wardens, and quite a massive number of in-prison maiming and murders—all heavily covered by the media. Except the explosion was caused by a gas leak. The bomb never went off. Subverted in the Heroes episode "Tabula Rasa". Noah uses a carbon monoxide leak as a cover-up for Jeremy Greer who accidentally killed his parents with his power. Nobody is fooled, and, in the end, a group of vengeful cops murder the kid. The government is fond of using explanations similar to this one in Buffy the Vampire Slayer, usually involving gangs on PCP, but the only time the actual "gas leak" excuse is used, it's by the heroes. Sunnydale Syndrome being what it is, it's a completely implausible and unanimously accepted explanation for what happened. In the season one episode "Bugs", Dean attempts to use this to get a family out of their house so they'll be out of the way of a curse, but the father doesn't buy it—Dean's on the phone impersonating a gas company employee that they met earlier in the episode and the father knows that employee's voice. Sam: Maybe we could tell 'em there's a gas leak. Might get 'em out of the house for a few hours. Dean: Yeah, and how many times has that actually worked for us? Sam: Yeah. [thinks some more] We could always tell 'em the truth. They pull the asbestos variation a few seasons later in "Family Remains" when they need to keep a family out of the house that they're moving into. A gas leak is mentioned, but the people they're talking to only really pay attention to the "asbestos" part. Unfortunately, the people moving into the house have someone who knows how to identify asbestos with them. He informs them that there's no asbestos in the walls and no gas leak, so they disregard what Sam and Dean said—including the truthful part: being there's a health hazard—and all nearly die as a result. In the first episode of the second series of Being Human, the villains use a gas leak excuse to clear out a whole neighborhood so they can use a psychic to find out what house the heroes—one of whom is a ghost—live in. The first episode of Wiseguy had The Mafia doing this because they wanted everyone out of a motel so they could use it for an arms deal. Which is just as well, because everyone started shooting at each other. In the first season, when Dr. Ferragamo's office is torched to cover up the evidence against Keith Palmer, the police initially report the possible cause of the fire as a suspected broken gas line. In 24: Live Another Day, a drone attack on a house that the CIA was investigating is covered up as being a gas main explosion. Subverted in Fringe. A gas explosion was the event; however, it was what caused said explosion that needed to be investigated. In the Monk episode "Mr. Monk Goes Back to School", Derek Philby gets rid of the school's groundskeeper by staging a gas explosion in his house: he makes a pinhole in the gas line so that fumes will come into the house, glues a match to the bottom of a door with the ends facing down, and puts a piece of flint on the floor. The matches strike the flint when the door opens, blowing up the house. Monk determines that said explosion was staged because the weather was unusually warm on the night it happened (meaning the victim should not have had any reason to be trying to manually light the pilot light for the fireplace), and the air conditioning unit was on. Played with in Sherlock—an explosion is assumed to have been caused by a gas leak, but is then discovered to have in fact been a bombing. Mundane variation: in an episode of Criminal Minds, the heroes tell a civilian that her neighbor's house, which contains samples of anthrax he was planning on releasing as a gas, has asbestos. The X-Files, "Jose Chung's From Outer Space": Jesse Ventura plays a Man in Black who tries to persuade someone who saw a UFO into questioning his vision and perception and believing he only saw "the planet Venus". "No other object has been misidentified as a flying saucer more often than the planet Venus." "Even the former leader of your United States of America, James Earl Carter, Jr., thought he saw a UFO once, but it's been proven he only saw the planet Venus." "If you tell anyone that you saw anything other than the planet Venus, you're a dead man!" On Nickelodeon's The Troop, the gym is destroyed by enormous worm monsters during a big dance. The Troop destroys the monsters and uses their miniature memory zapper monster (the snark) on everyone. As everyone surveys the wreckage, the Troop's adult advisor cheerily tells them that there had been a simple plumbing leak. In a later episode, they open a portal to a monster dimension and cover it with a tent and a gas leak sign. Unfortunately, the sign looks like one used by a band named "Gas Leak" and the heroes find themselves surrounded by fans who won't let anyone explain they're talking about a leak instead of the band. In an episode of Cold Case, a bomb was wired to a stove to make it look like the explosion was caused by a leaky gas pipe in the kitchen. The case is reopened years later when the new owners of the house find a piece of the detonator trapped behind a wall in the basement. Played with on The Vampire Diaries. The Council are all killed in a gas explosion. The official explanation is that a gas pipe was busted and the house owner failed to notice; however, the audience knows that the man actually disconnected the pipe himself and triggered the explosion in a strange murder-suicide. Stargate SG-1 played with this trope (as with so many others) over the seasons, coming up with mostly-plausible explanations for strange events on Earth. However, when an office building vanishes from downtown Seattle in a flash of light in one of the last seasons, the U.S. Government desperately goes for the "gas explosion" explanation—an explosion that somehow resulted in no blast or debris of any kind. The media comments on this, but can't figure out what happened (there's no reason to jump to "a human spaceship beamed it into space" after all). Haven: The Herald's editors Vince and Dave Teague use this excuse whenever the Troubles strike so often that Haven, Maine has got to be the leakiest town in America. It's a wonder anyone still lives there. The Professionals. In "Old Dog With New Tricks", the gas leak excuse is lampshaded by Crowley as to why the street outside a hostage situation is deserted. However the goal is not to cover up what happened, but to remove witnesses to the ruthless (and illegal) tactics that CI5 will use to end the situation. In the CSI: NY episode "Snow Day" a criminal gang uses a fake gas leak to clear out the police building so they can recover the drugs that the police had confiscated (worth about a hundred million dollars). In Stranger Things, Nancy, Jonathan, and Murray make up a story about a chemical leak from the Hawkins Lab being the culprit of Barb's death as to make the situation more believable, and thus expose the crimes of the lab without revealing the supernatural side of Hawkins. In Calvin and Hobbes, when Calvin comes home from school after running out of his class, he tries to claim that the school let all of the children go home early because there was a gas leak and everyone was evacuated. His mother isn't fooled, and calls the school. One! Pie plates, or as reflections in the atmosphere. In Mage: The Ascension, coincidental magic involved coming up with a plausible explanation for magic effects to avoid Paradox. One example given was justifying a fireball/explosion by saying it was a "natural gas explosion". This was a common tactic most of the supernatural conspiracies in the Old World of Darkness relied upon to uphold The Masquerade. Splinter Cell uses this to cover up the removal of a dirty bomb. Used again in Conviction by Black Arrow to evacuate the Washington Monument fairgrounds so that their men can move in to get Sam. Used again in Blacklist to cover up the vehicles Grim destroyed with a UAV in Tehran. Of course a gas leak could destroy a dozen SUVs while leaving everything else around them okay, but the Iranian government goes along with it since they are no more eager than Fourth Echelon to engage in a shooting war with the U.S. In the "Golden UFO" case in Raidou Kuzunoha vs. King Abaddon, the dragon Kohryu tells Raidou to make up an excuse to cover up sightings of him, suggesting swamp gases as a possibility. In Persona 2: Eternal Punishment, the fire at the sanitarium is explained as a "gas explosion". In Devil Survivor, this is the excuse given for the Yamanote lockdown. Almost nobody buys it, at least for very long. World of Warcraft subverts this trope as a joke. Upon entering "Area 52", the player sees a flash of light and is given a tooltip that persists for 30 seconds which says, "The flash of light you did not see has erased the memories you did not have." Assassin's Creed Origins states that Alan Rikkin's death in Assassin's Creed (2016) was purported to be a gas-leak. A highly specific gas-leak which killed one man in a packed room. Meanwhile, other Templar Isabel Ardant's death is blamed on some bad wiring at Buckingham Palace. Mr. Verres: Ah, some of my best work! 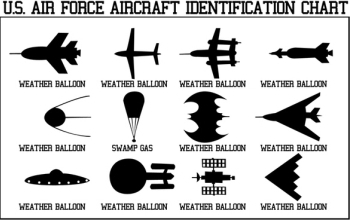 Though I have been using that weather balloon excuse a lot. I think I'll blame swamp gas next time. One story arc of The Wotch involved a conspiracy of militant mind-controlling feminists with an Elaborate Underground Base below the school. After everything has been resolved, most of the mind-control victims have no memory of what transpired, and them waking up groggy in the school basement is explained with...a gas leak, of course. In Ow, my sanity, David knew that the dorm incident would be covered up by either arson or a gas leak. It was the latter. Unity is assigned to come up with a cover story for a sewer-dwelling creature eating people and comes up with "weather balloons fighting swamp gas ". For a while Nick the Black Helicopter's Character Blog had the tagline "They said I was a weather balloon". SCP Foundation: Three hours after her birth, the hospital SCP-239 (AKA "The Witch Child") was born in was destroyed by an explosion. The press was informed that the explosion was due to a gas leak. If I Am Ever Head of an Alien-Monitoring Agency on This Very Wiki recommends avoiding covering alien/paranormal activity this way, as it's a bright neon "Something unusual happened here" sign to anyone even remotely Genre Savvy. Blame the damage on terrorism instead. In the first episode of the first season of X-Men: Evolution, after Scott Summers accidentally provokes a fire at a football game, Professor Xavier rewrites the memory of a nearby cop into thinking it was a leak in a propane tank. Inverted in an episode of The Simpsons, where a series of religious experiences turned out to all be caused by a dangerous gas leak that could've blown up and killed a lot of people had it not been detected. In "Into the Bunker", Grunkle Stan claims the damage caused to the Mystery Shack by an infestation of zombies was caused by "a big woodpecker". When the contractor doesn't seem to fall for that, Stan just straight-up bribes him. At the end of "A Tale of Two Stans" Grunkle Stan's long-lost brother manages to get The Men in Black out of town by claiming the energy caused by the Interdimensional Portal was actually from an unreported meteorite shower. It works because the agents just had their recent memories wiped. Metalocalypse: The Duncan Hills Coffee Company, eager to capitalize on a cross-promotion program with Dethklok, covers up a series of terrorist attacks on their stores by The Revengencers by repeatedly referring to them as "natural gas coincidence explosions". Played with in Justice League Unlimited. Lex Luthor secretly hacks into the Watchtower and fires its binary fusion generator at a Cadmus hideout, which is hidden beneath an abandoned warehouse in the middle of a town. The civilians don't know what happened and the League doesn't make a statement on it, but some assumed it was an industrial accident, while others saw a bright light in the sky and figured out it was from the Watchtower since the League had previously used their BFG on a previous mission, leading to the League getting hit hard with Hero with Bad Publicity. The British Government explanation for V-2 impacts was that the explosions were accidental ones caused by leaking Gas Mains. Contrary to popular belief, this was mostly aimed at the Nazis - the British were using turned spies to feed them inaccurate impact reports and didn't want the public news to muddy the waters. Incidentally, legend has it that one landed near a bar where the British Interplanetary Society were having a meeting, and they figured out what had really happened rather quickly. An odd, confusion-based example by the Paris Gun at the start of WWI. When the first shell impacted, Parisians thought that it was a gas main that had exploded, then, as more landed, that they were bombs from a zeppelin (as there was no engine noise). Eventually, it was realized that they were shells from a siege gun. The 1906 San Francisco Earthquake was an odd aversion. After the quake and ensuing fire city officials stated that it was only a fire and ignored the Earthquake part. Many cities had had great fires by this point so it wasn't anything unusual. But an Earthquake was a new thing for most Americans to fear. After the Trinity test of the first atomic bomb, officials released a cover story that a "remotely located ammunition magazine" had exploded. The cover story also mentioned "gas shells exploded by the blast" in case civilians needed to be evacuated away from the fallout. The whole "it was a weather balloon" coverup almost certainly comes from the Sky-hook balloon program, where this exact excuse was used countless times without being entirely wrong. See, sky-hook balloons were a program to use (more or less) really really big weather balloons for research and reconnaissance. Due to their secretive nature, few were told about them, even within the military, and the lack of control over where they went meant that many balloons landed near or drifted over populated areas. And with them a lot of explanations from soldiers to civilians that they were just looking at weather balloons, even though the things were way bigger than a weather balloon.